I'm sure some of us may have been seeing this advert from Etisalat. 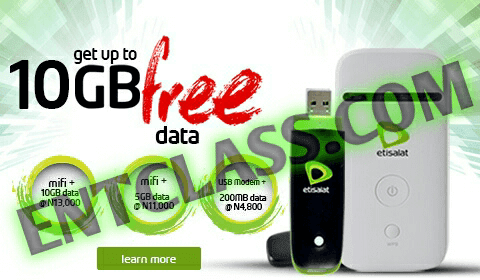 When you buy Etisalat Mifi or USB modern, you will be credited with 10GB, 5GB and 200MB respectively when you purchase any of the moderns. The 10GB and 5GB will be credited when you buy the Mifi modern while the 200MB will be credited when you buy the USB modern and all data is valid for 30days. Auto-renewal & Data Roll over does not apply to this free data. I'm sure you will be wondering if there will be any kind of Imei tweaking, but unfortunately, EtiMuMu don receive sense. If we could remember, their previous offer activation was via PIN. And this time around, the data will be activated by their Agents at the etisalat experience centers after the purchase of the mentioned Modern. Data is valid for 30 days. Hmm, things are not the same as before. Let's take what we see as we are now in Change. Everything is turning around for WISDOM. Can the mifi be unlocked to work with any other network?